You can turn that permanent frown upside down with a forehead brow lift. A sagging or deeply furrowed brow makes you look older and tired, but this cosmetic procedure can erase years from your appearance. While the aging process can’t be stopped, Dr. Cecil Yeung explains how a forehead brow lift works, and the alternatives available that may give you the most effective results. What benefits can you expect from a forehead brow lift? To gain the maximum benefits and results of a forehead brow lift, Dr. Yeung may also recommend you have eyelid surgery, at the same time. When both procedures are performed together, you’ll attain the finest, most natural-looking results available. What should I consider before my forehead brow lift? When you are considering brow lift surgery, there are a few important points to consider. The area around your eyes would benefit from eyelid surgery, for rejuvenating aging eyes. Loose or sagging skin creating folds or disrupting the natural shape of your upper eyelid, sometimes impairing vision, can be corrected with an eye tuck. Fatty deposits making your eyes appear puffy, bags under your eyes, droopy lower eyelids, and excess skin and wrinkles of the lower eyelid can all be corrected when you opt for a blepharoplasty procedure. Another consideration to keep in mind is, although brow lift results are sometimes permanent, the effects of the aging process or any major changes in your weight after surgery, could affect how you look. Also, since cosmetic surgery isn’t usually covered under Medicare or private health insurance companies, how to pay for your surgery will be a factor to consider when deciding on your procedures. When eyelid surgery is performed to eliminate skin covering the eyelashes, it may be covered by insurance. What are some alternatives to brow lift surgery? Dermal fillers help to reduce facial lines and bring back volume and fullness in the face. As you age, your face naturally loses fat, and muscles are now working closer to the surface. Dermal fillers correct wrinkles associated with muscle movements. Laser resurfacing also called a laser peel or lasabrasion, can erase years from your face by reducing facial wrinkles, scars, and blemishes. If your decision is that a brow lift is your best option, you may want to consider a coronal forehead brow lift. What is a coronal forehead brow lift? The coronal forehead brow lift Dr. Yeung performs has many advantages over other techniques that other plastic surgeons’ use. As mentioned earlier, a brow lift can fade over time when the skin sags once again in just a few years. Dr. Yeung combats this by performing a longer-lasting coronal forehead brow lift that focuses on both muscle and skin. A coronal forehead brow lift is a procedure where the muscle layer under the skin is repositioned, and then precisely and delicately, the skin is re-draped over the repositioned muscle. This type of brow lift leaves a minimum amount of skin tension and results in seamless scars. 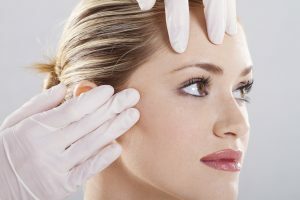 Where can I find the best alternative to a forehead brow lift in Houston? The Yeung Institute is headed by Dr. Cecil Yeung, a double board-certified surgeon and one of the best Houston facial plastic surgeons. Dr. Yeung’s experience, technical skills, and emphasis on minimally invasive procedures enable his patients to achieve natural-looking results. Take a look at the before and after photos of the beautiful transformations that can be uniquely your own. Whether you decide to have a coronal forehead brow lift, an eye tuck, dermal fillers or laser resurfacing or a combination of procedures, Dr. Yeung helps you decide what's best for the results you’re seeking. Dr. Yeung and his staff are committed to providing personalized services uniquely tailored to each patient’s individual needs and desired results. If you want to explore your options for achieving long-lasting and natural-looking facial revitalization, contact our office today to schedule an appointment. You can start the process by filling out the form here or call 713-795-4885 today to learn more about our cosmetic facial procedures.